Girl 1: What did you do over Christmas break? Girl 1: Oooh, I love The Ritz-Carlton! My Girl: Me too; it is the best place to stay! Several other kids in the class chimed in that they too had been to several different Ritz-Carltons around the world and they all agreed that it was the best place to stay. No Holiday Inn for these kids! As we often tell our son (who has champagne tastes on a $10/week allowance), plan a lucrative career now to support yourself because this gravy train stops soon. But really, you can’t blame the kids; Ritz-Carltons are nice. 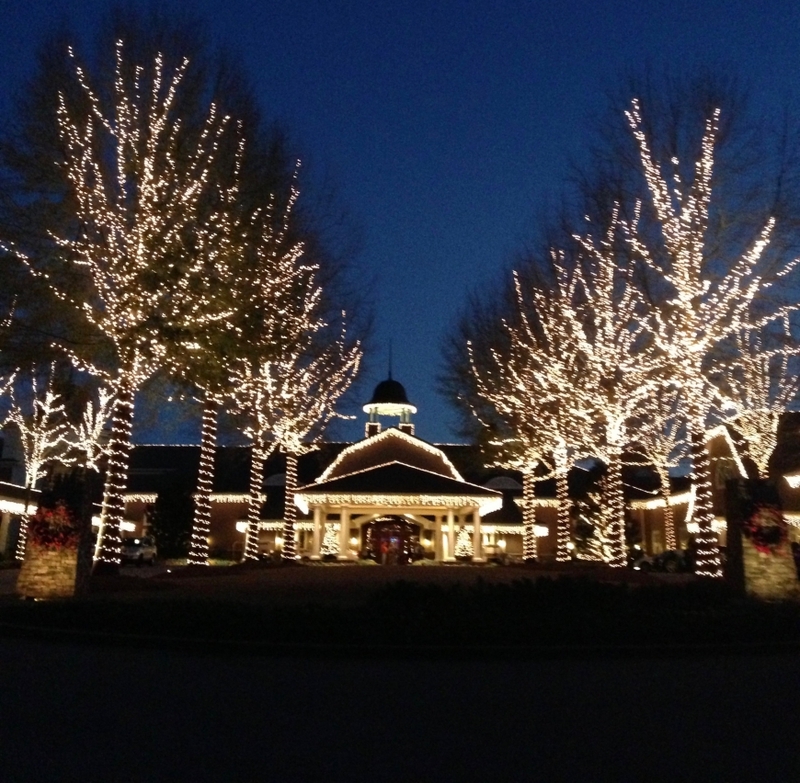 Recently we went to The Ritz-Carlton Reynolds, Lake Oconee. It’s in Georgia, about an 1 1/2 drive from the city of Atlanta. This was our second visit there and once again we had a wonderful time. Our first visit was a couple of days before Christmas. 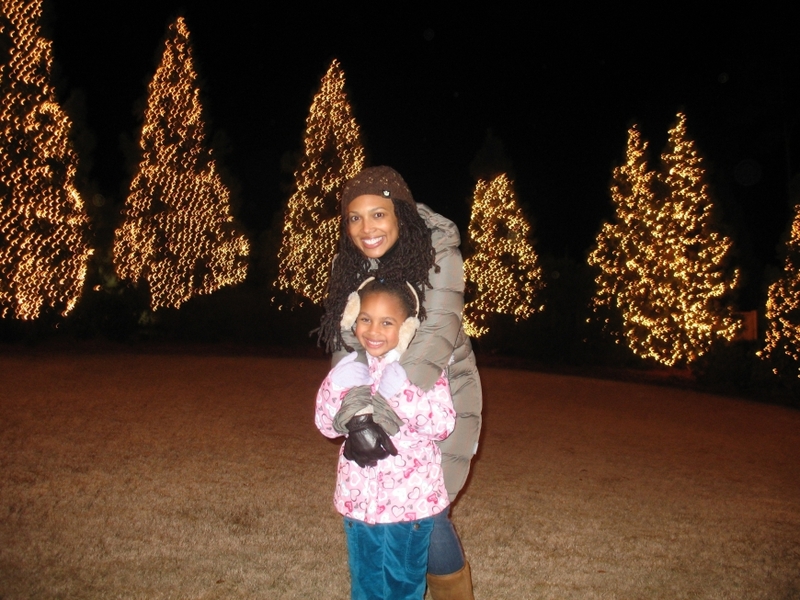 We just wanted to relax and reconnect as a family before the hustle and bustle of Christmas fully descended upon us. The Atmosphere: The hotel looks like a lodge; it is new, but it was built to look old. The lobby is huge and was decorated for Christmas with a gigantic (real!) gingerbread house and several Christmas trees. There are also Christmas trees throughout the whole hotel. We loved the atmosphere in the lobby lounge and spent most of our time there on the sofa right in front of the huge wood-burning fireplace. There is also a terrace outside the lobby lounge with rocking chairs that overlooks the grounds and lake. Outside at night thousands of white lights twinkle from the hotel and on all the trees. We went for a walk in the night just to see all the lights. The bellhop told us that the Ritz deliberately has “smells” piped in all over the hotel and it did smell wonderful everywhere. The Room: We stayed in a standard room and while it was not very large (460 square feet), it was very well appointed. The beds were incredibly comfortable with feather toppers, fluffy pillows and down comforters. We had two double beds, an arm chair by the terrace window, a desk and chair, an armoire with the TV, dvd player and drawers for clothes and a huge closet. In addition there was a unique coffee and tea maker and a honor bar (that we didn’t use). The bathroom was beautiful and spacious with a separate toilet, marble shower and a huge tub. There were 2 adult robes hanging and when my son tried to wear one, I noticed a note saying that housekeeping will deliver child-sized robes upon request. Right away they brought a robe sized for my daughter and another one sized for my son to our room. A request for more towels was met immediately as well. Sliding glass doors opened up onto a small patio with two chairs. The Club Level: While I had wanted to book the Club Level initially, my husband talked me out of it. But upon arrival he wanted to stay on the Club Level and when we tried to book a room, there were none available. The front desk manager (Gail) was so kind and obtained Club Level keys for us to use the Club Lounge at no charge. The lounge was beautiful with sofas, chairs, a fireplace and a Christmas tree; more intimate and much quieter than the lobby lounge. There were tables and chairs and large windows with a view of the grounds. There was also a computer with internet access and several newspaper publications available. Five “snacks” per day were served: continental breakfast, afternoon snacks, afternoon tea, cocktails & hors d’oeuvres and chocolates & cordials. There was always soda, water, coffee, wine and cookies (delicious!) laid out. The “afternoon snack” was really fixings for sandwiches and salads; that was our lunch one day and the hors d’oeuvres were great. We didn’t have the continental breakfast or afternoon tea, but we did go to the lounge often for drinks, cookies and dessert. If you can swing the price, especially if you drink alcohol, the Club Level is worth the extra charge. The Lodge Restaurants: The food was excellent. We only ate at the Lobby Lounge and Georgia’s during this trip. We ate burgers and pizza in front of the fireplace in the Lobby Lounge one night (we really tried never to leave the fireplace) and all was very good. Both mornings we had breakfast at Georgia’s. There is a menu, but we chose the buffet. There was an omelet station, grits and biscuits with all the fixings, pastries, meat, eggs, potatoes, fruit and a chef’s choice of the day. Everything was delicious and plentiful. One night we ate dinner at Georgia’s, a 4 diamond restaurant. Although it was the same restaurant that we ate breakfast in, the atmosphere was different with candles, dim lighting, and the fireplace burning. We requested a table by the fire. The service was incredible and the food was excellent. Of course my son ordered the single most expensive thing on the menu. It is a very nice restaurant, but kids are welcome and there was a kids’ menu; my daughter ordered the “bento box”. Although we dressed up and most people were dressed in a similar fashion, the official dress code is “resort casual.” We didn’t get to experience the famous and romantic Chiminea Dinner on the lake with our own private fire pit and blankets. At $125 per person that will just be for my husband and I! Hotel Activities: The grounds are beautiful—even in the winter. There are walking and biking trails and a playground. Although it was too cold to be in the lake or pool, the pool was open and heated; it is an infinity pool and gives the illusion of dropping into the lake. There is a hot tub near the pool and lots of lounge chairs. 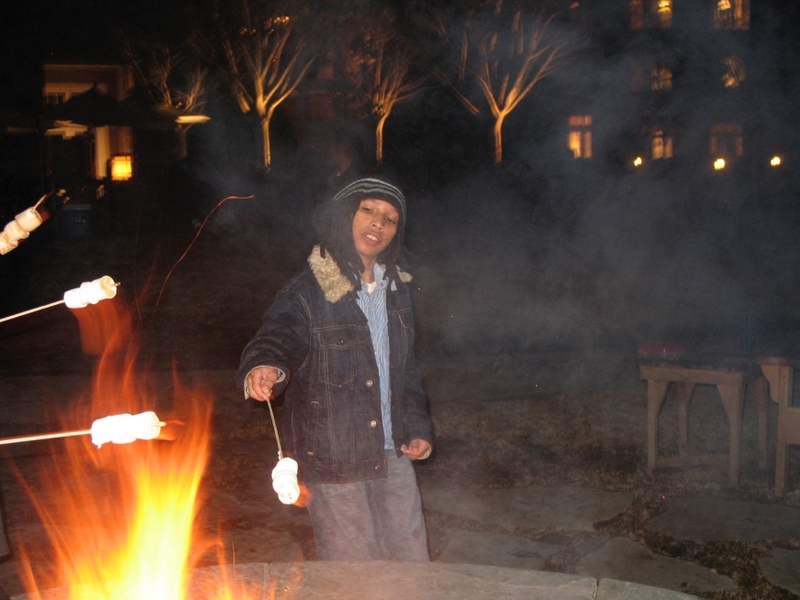 Our favorite activity was the bonfire every night! That was so much fun roasting marshmallows and eating s’mores; everything is provided by the hotel as well as hot cider. We don’t golf, but I’m sure most guests come to this particular Ritz-Carlton because of the world-famous golf courses. Indoors we spent most of our time in the lobby lounge and bar sitting by the fireplace reading books aloud and playing card games. There was a nearby table stocked with checkers, chess and playing cards. There was live music every night, flat screen TVs (my husband was in heaven watching sports), and plenty of comfortable leather sofas. Especially for Kids: While this is a great hotel for adults alone, it was great for us as a family too. Upon arrival my daughter was given a light-up ring and the both kids were enthusiastically welcomed. Besides playing on the playground, grass and lake beach or swimming in the pool, there were several activities just for kids. There was Milk & Cookies with Mrs. Claus in the lobby; an elf passed around sippy cups full of milk and a basket of (delicious) gingerbread cookies to munch on as Mrs. Claus read Christmas books. Breakfast with Santa was available and kids were encouraged to come in their pajamas. There was a Gingerbread House Workshop that we didn’t attend because the advanced reservations were full. There were two ballrooms with kids’ activities going on: one showed movies all day and one had board games and air hockey. The Spa: This was the best spa that I have ever gone to. The service was incredible. Upon my arrival I was given a tour of the facilities, a key, locker, robe and slippers. In one area there is a dry sauna, steam room, hot tub (in front of a fireplace), cold plunge pool and several terry cloth-covered lounge chairs. In another area there are several showers with towels at the ready outside each shower stall and all the toiletries that you could possibly need. I arrived about an hour earlier than my massage appointment and took a dry sauna, steam bath and shower. Afterwards I just read a magazine and relaxed on a lounge chair. With candles lit, the fireplace going and soft music playing, I was almost asleep. After my massage (not the best one that I had, but good enough), I browsed the well-stocked boutique. There is an indoor pool downstairs with a hot tub in front of a fireplace and several poolside lounge chairs. I saw a towel station, kickboards and noodles as well. We did not go swimming, but I did see kids in the pool. I think the spa service charges are a little steep, but if you are staying at the hotel you can use the spa amenities without getting a service. Our latest trip to The Ritz-Carlton Reynolds was taken in October, so we experienced different things. It wasn’t quite warm enough to use the outdoor pool, but our kids swam anyway and we all used the hot tub. There is a small beach on the lake and many kids played in the sand and in the lake. The fireplaces throughout the property were not lit at all during this season, although it was fall and sort of cool at night. There were canoes, fishing poles and bikes for rent, but we didn’t do any of that. Mostly we walked the trails and sat on the edge of the lake just talking and laughing. Next time we have to bring our fishing poles and bikes. The lounge was again lively at night with a great jazz band playing. Friday night there was a chocolate buffet for $15 per person; we bought 2 buffets and ate chocolate until we were sick. It was delicious and worth the money. During this time there was also a chef sculpting a chocolate sculpture for 2 hours; that was a wonderful show and like watching a Food Network Challenge live. The next night we indulged in the nightly s’mores at the bonfire. This was the first time that we ate at Gaby’s on the Lake. It is a large open-air restaurant and bar right on the lake and it is the only restaurant on the property that is open continuously from early lunchtime through late dinner. The atmosphere and view were great and the food was delicious. This was the most popular spot to watch the many football games shown over the weekend. We also ate at Linger Lounger Steakhouse; it’s right on the golf course and a short walk from the main lodge. It has more of a “manly/club house” atmosphere with big leather chairs, but we all enjoyed it. A valet took us back to the lodge in a golf cart; that was a fun ride for the kids. The ceilings are very high and the hotel is huge and therefore very cold. Bring a heavy sweater to wear in the lobby or snag the sofa by the fireplace (in the winter) and never move. There are many things to do and several special activities everyday at the hotel, but they are not readily marketed. I don’t know why. Ask at the concierge desk and pick up a calendar so that you won’t miss out on anything. There is also a map with all the walking and biking trails, but again you have to ask for it. 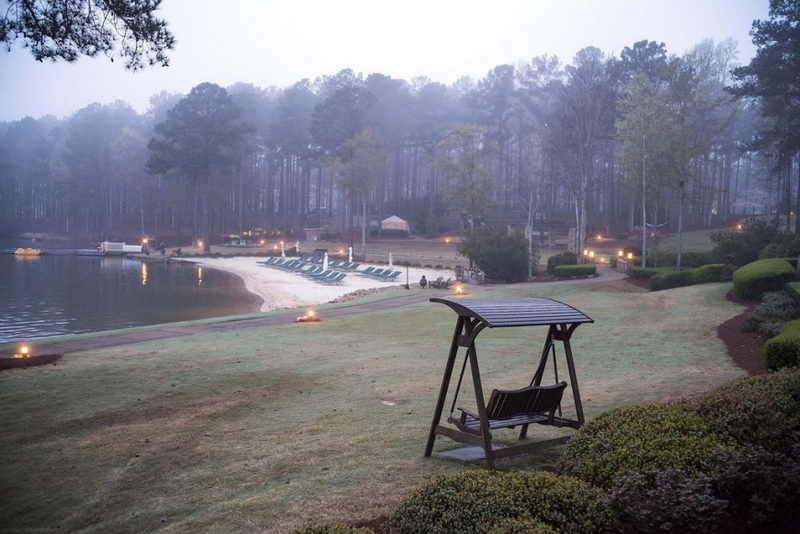 This resort is a hidden gem in Georgia and I really shouldn’t have written this review because I don’t want everyone to know! I’m sure that we will return and often. P.S. You may also like to read my other Ritz-Carlton reviews. What a great review – both of them! Ever think about being a travel writer? Something to consider. Renée aka Mekhismoms last blog post..Finally!